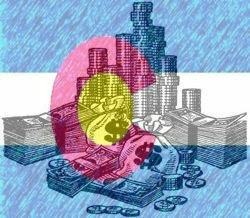 Home › Articles › Are Colorado Charter schools in Jeffco getting free money? 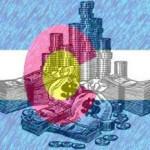 Are Colorado Charter schools in Jeffco getting free money? According to a recent report, charter schools were not required to pay for any portion of the related debt service obligations (principal and interest), despite the fact that they received capital improvement resources from taxpayers. So who is fronting the bill? It turns out that these debt obligations fall into the lap of the Jeffco school district. Simply put, this report suggests that, non profits organizations who govern charter schools, essentially get free loans while Jeffco taxpayers are stuck paying the interest- even if those non profits close up shop. Continuing our series on the following information reported by Don Oatman in the “OVERLOOKED ISSUES PERTAINING TO JEFFCO CHARTER SCHOOLS,” this section focuses on issues regarding to charter school capital improvements and debt services. 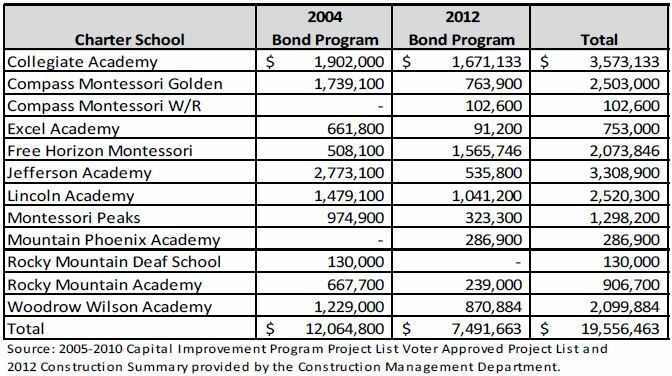 A cost directly incurred by Jeffco taxpayers for charters schools involves the debt service obligations for that portion of the resources provided by Jeffco to the charter schools for projects included in the 2004 and the 2012 bond construction programs. The charter schools receive resources for capital improvement, but are not required to pay for any portion of the related debt service obligations (principal and interest on the bonds); these are an obligation of the Jeffco school district. EXHIBIT 5-1 provides a summary of the charter school capital improvement budgets for both bond programs. EXHIBIT 5-1 identifies only the principal amounts for the 2004 and 2012 charter schools construction programs; it does not include the interest costs required for repayment of the bonded debt. The principal amount related to the construction projects and the related interest is paid over the 20 year repayment period of the bonds. The debt service payments for the 2012 bond program are easily identified from the repayment schedule in the 2013-2014 Jeffco budget; a similar computation for the 2004 bond program is difficult to determine because the original repayment schedule is not available from public information provided on the Jeffco website and because it is probable some of the original bonds have been refunded since the original issuance and replaced by other securities. EXHIBIT 5-2 provides an estimate of the annual 20 year cost for both the principal and interest obligated by the 2012 bond construction program. Because debt service payments for bonded indebtedness are paid over a 20 year period with the actual annual amounts for both principal and interest varying from year to year depending on the timing of the principal payments, the actual amount to be paid in a specific year will vary, however, Exhibit 5-2 reflects the annual average debt service obligation for the charter schools and the Jeffco managed construction projects based on the percentage of the principal amount to be expended for the charter schools capital projects associated with the 2012 bond construction program. Similar information pertaining to the 2004 bond program is included in EXHIBIT 5-­3. Because of refunding activities, the exact amount of the debt service obligation for the 2004 bond program cannot be determined from the available public information, thus, an estimate for the 2004 program has been determined using the relationship between the principal and interest for the 2012 bond program as the basis for the 2004 calculation. When the amounts for both the 2004 and 2012 debt service obligations are combined, it is estimated that the annual debt service cost incurred by Jeffco for capital improvements made to charter schools is $1,552,143. Because the revenues for the Jeffco Debt Service Fund are financed entirely by property taxes, this amount is being paid by all Jeffco taxpayers. This information is summarized in EXHIBIT 5-4. These exhibits may not be precise as they are based on budget amounts and not actual expenditures for each project. Information pertaining to the actual project costs is not available in materials currently accessible to the public; however, the Board of Education approved an addition/renovation contract for the Montessori Peaks Charter School in the amount of $1,676,255 on May 31, 2007. The budget amount from the Jeffco project list for the 2005-2010 capital programs for the Montessori Peaks Charter School was $974,900. This represents an increase of $701,355 in the cost of this charter school project from the original budget identified in the 2005 capital improvement program, a 42 percent increase in the cost of this project. If there were other similar increases of this nature, the overall cost for the debt service associated with charter school capital improvements will be greater than the amount indicated in EXHIBIT 5-4. The two Compass Montessori programs have two facilities with a single Executive Committee. The Golden campus provided a loan of the 2004 bond resources to the Wheat Ridge campus to reduce existing outstanding debt for the Wheat Ridge campus. A somewhat similar transaction occurred between the Excel Academy and the Rocky Mountain Academy of Evergreen. In this situation the Excel Academy loaned unneeded bond proceeds to the Rocky Mountain Academy of Evergreen. These situations are discussed in the Notes to the Basic Financial Statements for the four charter schools, however, the financial impact of the transactions are not part of the Basic Financial Statements for the charter schools as the loans have no remedy if they are unpaid. These transactions are discussed in more detail with Issue Number Six – Perceptions of Financial Transparency and Charter School Audits.